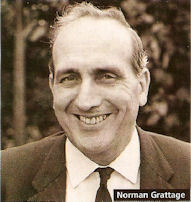 Norman, who died on Wednesday 4th March 2009, was the track racing promoter at the Fallowfield Track in the 1950’s through to when Reg Harris bought the track and it was renamed “Harris Stadium” shortly after he became grounds manager. When the track was sold to Manchester University he continued in that capacity until he retired in 1983. He promoted for the Manchester Track Racing League, two nights a week and also was a promoter of Open Easter and Whit-sun International meetings and also of then famous Manchester Wheelers’ Club “Muratti” Gold Cup meetings he also was Chairman of the World Championship Committee at two World Championships at the Leicester Track, with his friends Benny Foster and Derek Bowyer they also promoted a number of National Championship meetings at the Leicester Track. He instigated the bringing of Top Professional riders with the help of his great friend Reg Harris to whatever meeting he could when they became available. Much to the delight of the very large crowd support that Fallowfield track had, not that he neglected the amateur riders he put on programs with a great deal of thought to try and encourage up and coming and established stars to improve for which many stars had Norman to thank for his great help and understanding. Although Flo and I were a great help to Norman he also was a great help to me when I was the Centre Massed Start Secretary for the old National Cyclist Union. Then he help with the first massed start circuit races we held at Heaton Park which were a great success, we with the great help from Tommy Barlow and lots of help from Jack Fletcher, mapped and sorted out the course and promoted the successful Manchester Wheelers’ Club, Manchester to Birmingham Road race. Also he was chief commissaire driving his car or on the back of a motor cycle on the open road circuit races we promoted around the Siddington area. He also sat on the National Racing Committee’s, also he was the holder of the National Gold Badge of Honour, he promoted courses to train Commissaire and Judges to a very high standard and a lot of present day people are indebted to his early help and advice. He helped in the promotion of the first track races at the new Manchester Velodrome and promoted the very successful track meeting The “Jack Fletcher” memorial meeting in respect of his good friend Jack. All this is to honour what cyclists think is a great track manager and yet apart from being a modest time trialist, he first started racing as a novice with the Ashton Road Club and was to fast in his first time trials to be able to compete in the next years Withington Wheelers Novice event, he rode after the war with the amalgamated Abbotsford Park Road Club and I suppose his best performance was to win a medal in the Manchester Wheeler’s Open 100. He joined the Manchester Wheeler’s Club in 1950 and soon was a member of the committee and always checked in the Wheelers’ 100’s and 12 hour events. His first love though was Continental Road racing and he travelled to France before the war to see the Tour de France. After his service in the R.A.F. in Rhodesia and back into cycling he used to take two daily continental papers: La Gazzetta dello Sport and L’Equipe; also 3 weekly sports magazines Mirror sprint etc. to satisfy his continental cycling knowledge. His favourite continental road rider was Fausto Coppi, still a legend after all these years and we were witness to his World Road Race Championship win at Lugano. He was an enthusiastic viewer of continental road races on the satellite T.V. I will finish, saying goodbye to a very dear friend who we first met on an Easter training weekend to Lichfield in 1946, a truly lifetime friendship.